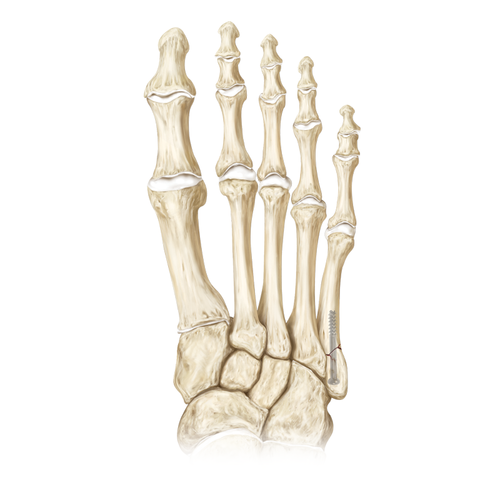 A fracture of the foot is a break in one of the bones that makes up the foot or toes. Fractures of the foot are usually caused by trauma. Sports injuries, falls or direct blows to the foot can lead to fractures. Kicking or walking into an object is a common cause of toe fracture. “Rolling an ankle” can lead to a fracture of the fifth metatarsal or other bony or soft tissue injuries. Pain, swelling and loss of motion at the affected joint are common findings. Swelling, bruising and tenderness will be present on physical exam. X-rays can help confirm the diagnosis. 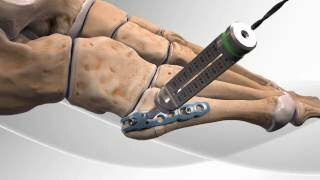 Some non-displaced fractures of the foot can be treated non-operatively. Immobilization in a cast, splint, or walking boot is recommended for six weeks or more. Patients are instructed to use crutches and remain non-weight bearing while the fracture heals. Healing of the fracture can be visualized on follow-up X-ray usually starting at 4-6 weeks. Displaced fractures may be pinned in place or corrected with a plate and screws. Once the fracture fragments have healed, therapy may be initiated to regain strength and motion.